Whenever I would try to make homemade biscuits using baking powder as the main leavening ingredient my attempts would always fall flat. Literally. The biscuit felt heavy and tasted so – blah. I wasn’t a fan and would always return to using my favorite, side-popping can of store-bought biscuits whenever I felt the need arise for some good biscuits and gravy for breakfast. 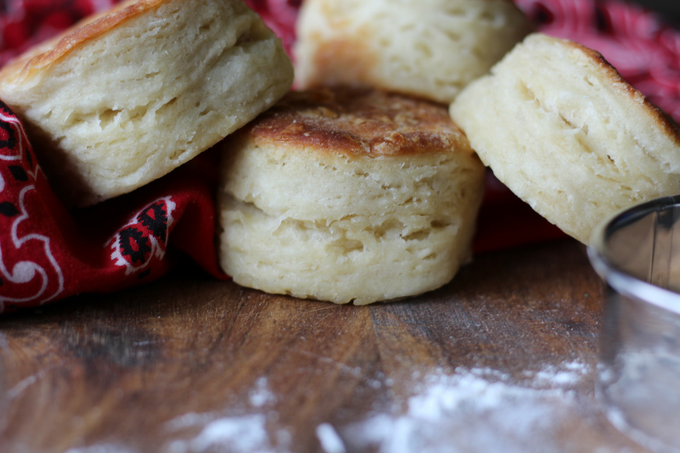 Then I found the secret to perfect homemade biscuits…. although maybe not traditional it had the desired effect of great flakiness, texture, and a wonderful flavor. The key is to add yeast! And presto! 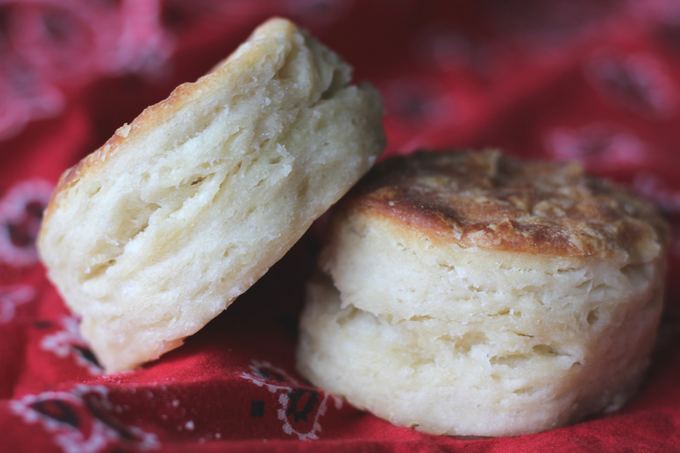 You have yourself Better Than The Can Buttermilk Biscuits. 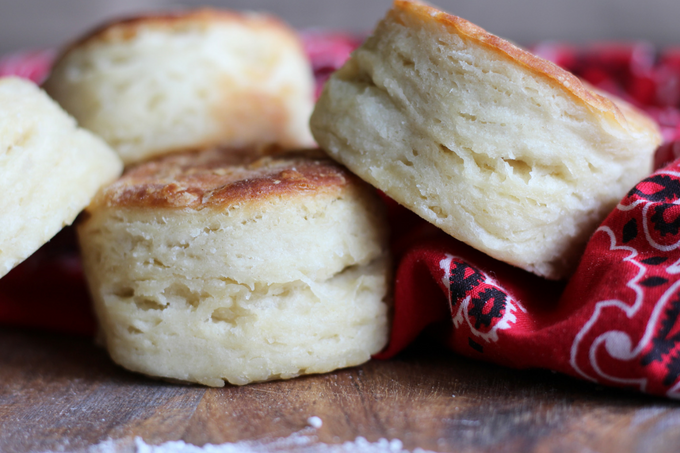 The yeast insures that the biscuits get great rise and have amazing flavor. With the help of some added butter of course. After mixing, the dough needs a chance to rest in the refrigerator overnight. It works perfect to make the dough the night before, or even a few days in advance. Then the morning you are wanting fresh biscuits; roll the dough and cut out the biscuits. My favorite breakfast food is by far biscuits and gravy. And these biscuits are perfect for drowning in homemade sausage gravy, paired with scrambled eggs and fruit. 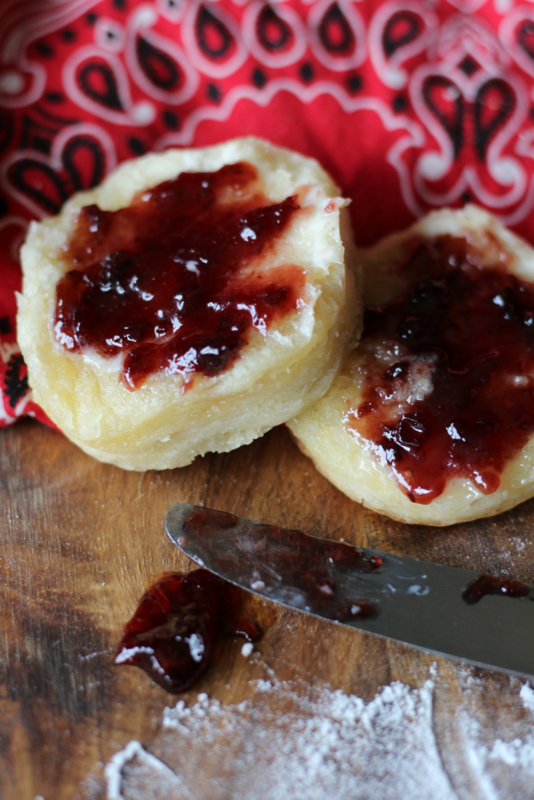 Use them to make your own version of an Egg McMuffin or just simply add butter and jam. See? 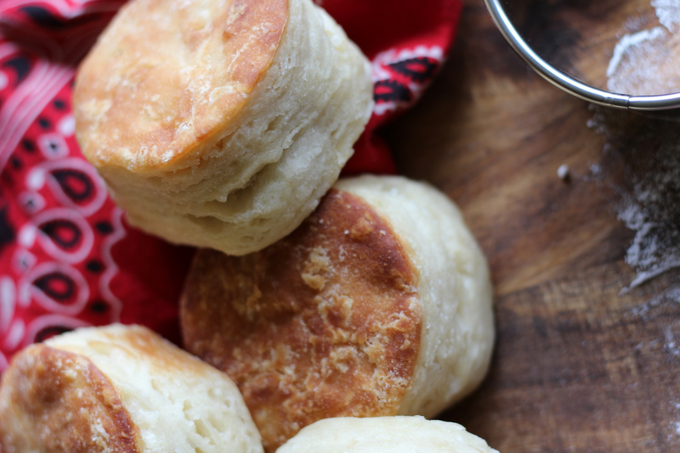 Better than the Can Buttermilk Biscuits. In a bowl, combine the yeast, water, and 1 Tablespoon of sugar. Set aside until mixture is foamy, about 5-10 minutes. Meanwhile, in another bowl, whisk together the remaining dry ingredients; remaining sugar, flour, baking powder, baking soda, and salt. Then work the small pieces of butter into the dry ingredients using either a pastry cutter or a fork, until the butter is the size of small peas. Into the bowl, add the yeast mixture and buttermilk. Stir until the dough just comes together. Do not over mix! Turn the dough out onto a lightly floured surface and knead a few times. The dough may be slightly crumbly depending on your weather, so squeeze and knead until the mix is combined and no visible bits of dry flour. Return dough to a greased bowl, cover, and refrigerate overnight. When ready to make biscuits, turn dough out onto a heavily floured surface. Using a rolling pin, roll out the dough to 1/3 to ½ inch thickness. Using a biscuit cutter (I use my 2 ¼ inch cutter) cut biscuits as close together as possible and arrange with sides touching on an ungreased baking sheet. Gather dough scraps, knead together, roll out and cut more biscuits until all dough has been used. Melt 2 to 3 tablespoons of butter and brush over the tops of the biscuits. Let the biscuits rise in a warm place for about 30 minutes. 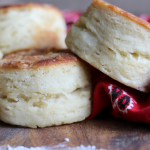 Bake the biscuits at 425 degrees for 10-12 minutes or until golden brown.